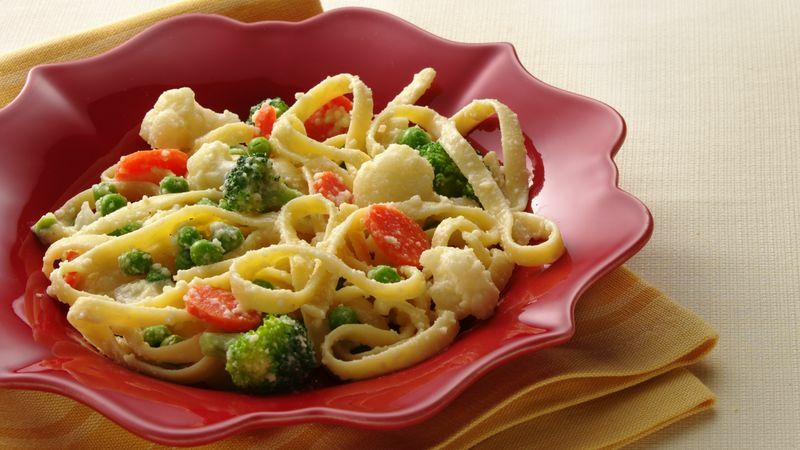 Cook fettuccine as directed on package, omitting salt and adding broccoli, cauliflower, peas, carrots and onion for last 3 minutes of cooking. Drain; return to saucepan and keep warm. Meanwhile, in 10-inch skillet, heat butter and milk over medium heat, stirring frequently, until butter is melted and mixture starts to bubble. Reduce heat to low. Simmer uncovered 3 to 4 minutes, stirring frequently, until slightly thickened. Remove from heat. Stir in cheese, garlic salt, nutmeg and pepper. Stir cheese mixture into pasta mixture. Serve a salad of sliced fresh tomatoes drizzled with fat-free balsamic vinaigrette for a colorful, meatless meal.